High-end department store Nordstrom has hit quite the rough patch, likely because of its continued discounting. Updated to include comments from CFO at Piper Jaffray. Looking at Nordstrom's (JWN - Get Report) performance over the past year, one would think rich people were in dire straits because of the stock's 50% plunge. The high-end department store is fresh off a stunning first-quarter earnings miss and ugly guidance reduction. First-quarter earnings came in at 26 cents a share against forecasts of 46 cents. Sales tallied $3.19 billion compared to estimates for $3.28 billion. Comparable-store sales fell 1.7%. Nordstrom lowered its full-year profit outlook to $2.50 to $2.70 a share, down from previous estimates of $3.10 to $3.65. Last year was nothing to write home about either. Profit plunged 17% and same-store sales rose a meager 2.7% as the company battled fierce competition online and sluggish traffic to its bricks-and-mortar locations. During a presentation Wednesday to investors at Piper Jaffray, Nordstrom's CFO Mike Koppel pointed to several explanations for the company's weak sales. "Clearly there has been a shift in how consumers are allocating their dollars," said Koppel, acknowledging consumers are spending more on durable goods such as appliances and other home goods as opposed to designer apparel. Koppel added that sales are being hindered by a lack of exciting new fashion and the rapid shift to online shopping. The brutal results prompted Nordstrom to make several cost-cutting measures, surprising in the sense the company is supposed to be in a constant state of success from hawking $500 stiletto pumps to those with higher incomes. 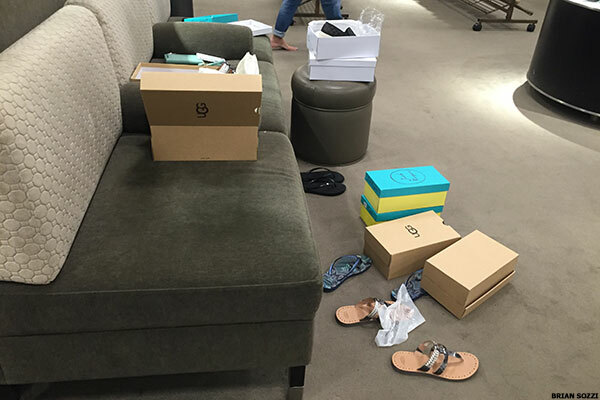 A messy women's shoe department has become the norm at Nordstrom, believe it or not. In February, Nordstrom -- which has invested billions of dollars in e-commerce and into sprucing up its stores in recent years -- said it will rein in its tech spending in order to cut costs. Then, in April, it announced it would slash 350 to 400 positions, mostly at its headquarters and within its regional support teams. Nordstrom expects the layoffs to be completed by the end of the second quarter. Savings this year are pegged at about $60 million. None of the cost-saving moves have caused investors to regain confidence in Nordstrom's near-term profit outlook. Shares have nosedived about 50% in the past year compared to a 1% decline for the S&P 500. The lone win for Nordstrom in the past year -- signing a new partnership with Tesla (TSLA - Get Report) that will bring a showroom for the electric car maker's Model X to the company's store at The Grove mall in Los Angeles. According to Koppel, Tesla approached Nordstrom and will lease space from the retailer. "We have a high degree of customer overlap," said Koppel, who stopped short of saying there will be additional showrooms. In light of the company's seemingly endless wave of bad news, TheStreet visited a Nordstrom store in Westbury, N.Y., to see if there was something in particular killing the company. The answers became pretty evident as soon as walking in and bypassing the messy ladies shoe department (see above). 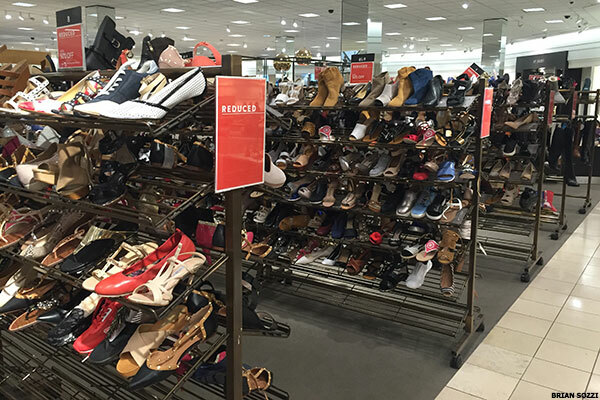 No, this is not a Nordstrom Rack. Nordstrom's inventory ballooned 5.3% year over year in the first quarter as same-store sales declined and badly missed plan. Despite a decent U.S. economy and resilient stock market, the reality is that the upper middle income shoppers who once frequented Nordstrom's stores are no longer doing so consistently. Nordstrom executives have to get out of the mindset that it's the rip-roaring 2007 credit boom U.S. economy and start planning inventory more in line to sluggish sales trends. Data suggest planning inventory correctly remains a major issue at Nordstrom. The company's inventory turnover ratio, which measures how fast it turns over its inventory within a year, has slowed for five consecutive years. Ultimately, rows of unsold inventory send a message to consumers that they should never pay full price at a Nordstrom store and might as well just wait for a great deal. Boy, are those deals on offer right now. 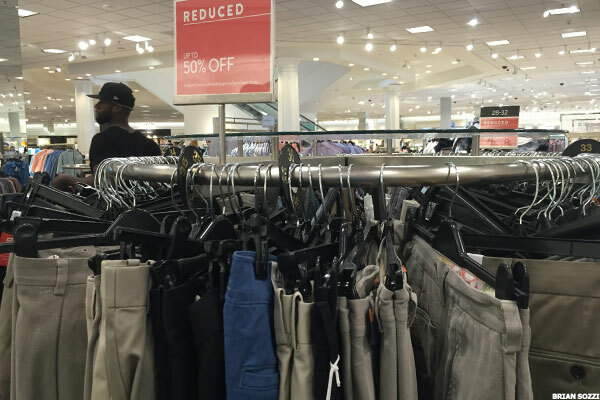 Nordstrom's apparel departments are overrun with discounts. Nordstrom's current excess inventory issue seems to span the women's shoe department all the way to the men's shirt section. In fact, our walk through this particular Nordstrom store had us thinking it resembled Nordstrom Rack, which is the company's off-price chain. As a result, the discounts are hot and heavy at Nordstrom, which is disconcerting from two standpoints. First, the company is just about midway through the second quarter, and seeing rows of discounted items suggests that sales trends haven't improved much from the first quarter. Second, excessive discounting at a high-end department store -- which has been the case Nordstrom during its stretch of weak performance -- erodes the value of the brand in the minds of consumers. In effect, Nordstrom is training customers to expect discounts at its full-price stores, which is a major faux pas.